This story originally contained interactive charts, which are currently unavailable due to a technical error. Thank you for your patience as we work to restore them. The CrunchBase Women in Venture report is the third study in our ongoing analysis of women and their participation in the startup ecosystem. Previously we reported on the steady increase in the number of women founders and the universities that produce them. In this study, we looked at two new questions. First, we set out to determine how many women are true investing partners at the leading venture and micro-venture firms. While everyone knows that the number of female investing partners is very limited, we aimed to establish a well-defined baseline against which to measure future progress. Second, we wanted to explore which venture firms have the strongest track record of supporting startups with at least one female co-founder. In particular, we wanted to see if firms with female partners were any more likely than average to invest in female entrepreneurs. This is a less-well-explored area but one that CrunchBase is well-suited to address because of its efforts last year to sharpen its data on women co-founders and this year to do the same with data on female venture capitalists. To answer the first question, we looked at the top 100 venture firms globally, based on longevity (active since 2010), recent activity (investing in 2014 and 2015), rounds led and fund size. We looked at all the women listed as “partners” at those firms, and screened that list to ensure they were true “full time investing partners,” which, in our definition, means the authority to invest the partnership’s funds. We excluded many women who have a “partner” title but do not invest, though they may have important roles in communications, finance, talent, analysis, administration and other areas. In order to calculate the percentage of female versus male partners at a firm, we were also careful to filter male “partners,” according to the same standards. 7% of partners at top 100 venture firms are women. Once we carefully reviewed the data for the top 100 venture firms, we discovered that 7 percent of the partners, or 54 of 755, are women, and 38 percent of the top 100 firms have at least one female partner. Twenty-eight firms have one, while seven have two. Sequoia Capital is one of the firms with two female partners, both based in China. Canaan Partners has three. Qiming Venture Partners, based in Shanghai, has four. NEA tops the chart with five female partners, with one partner based in India. On a percentage basis, two-partner Floodgate is at the top of the list with 50 percent female partners. Another 14 of the 100 top firms have 20 percent or more female partners. It is interesting to note that Scale Venture Partners and Greycroft Partners, two of the firms with the highest percentage of female partners, 33 percent each, were co-founded by women, as was Floodgate. These three are the only female co-founded venture firms in our top 100. Below are charts that rank the top 100 firms according to the number of female partners and the percentage of partners who are women. As a check on our top 100 data, we also looked at a more comprehensive list of venture and micro-venture firms, capturing those in CrunchBase that have been active since 2014. When we applied our “investing partner” criteria to those 2,300 firms, we found that 8 percent of partners in CrunchBase are women. That outcome reinforces our finding that 7 percent of partners in the top 100 firms are women and suggests that the pattern at the top firms is representative across the industry. The same analysis of 54 active corporate venture arms and 101 accelerators that have been active since 2014 produced more elevated results. Women hold just under 12 percent of the partner roles at both accelerators and corporate venture firms. CrunchBase will continue to track these numbers in the years ahead. We fully expect that more women will land in the coveted partner role, both as firms make it a priority to hire and promote women, and as women themselves start more venture firms. Data in CrunchBase suggests that more women are entering the venture industry and potentially moving into position to win partner roles. Of the 826 firms in CrunchBase that have substantial teams, women hold down 22 percent of the roles on the investment team at the associate, vice president and principal levels. Venture partnerships, however, are notoriously slow to add new partners, whether they are male or female, so it’s difficult to assess how quickly those team members will capture the partner spot. Women hold just under 12% of the partner roles at both accelerators and corporate venture firms. A potentially more rapid path for women to become partners is the growth of female-founded venture firms. In the last three years, according to CrunchBase data, 16 percent of newly launched venture and micro-venture firms, 20 firms in all, had at least one female founder. Looking out over five years, the percentage drops to 12 percent and 29 firms, which suggests that the creation of female-founded venture firms is accelerating, albeit off a very low base. No less important, it appears that female co-founders are well-disposed to hiring female partners. According to our data, when there is a female co-founder, the overall percentage of female partners in the firm soars past the top 100 figure of 7 percent. At the 29 firms founded by at least one female co-founder in the last five years, fully half of the investing partners are women. To get a longer-term perspective, we’ve listed firms in CrunchBase founded by women going back to 1989. In a study posted in May last year, CrunchBase reported the percentage of funded startups with at least one female founder increased from 9 percent to 18 percent between 2009 and 2014. 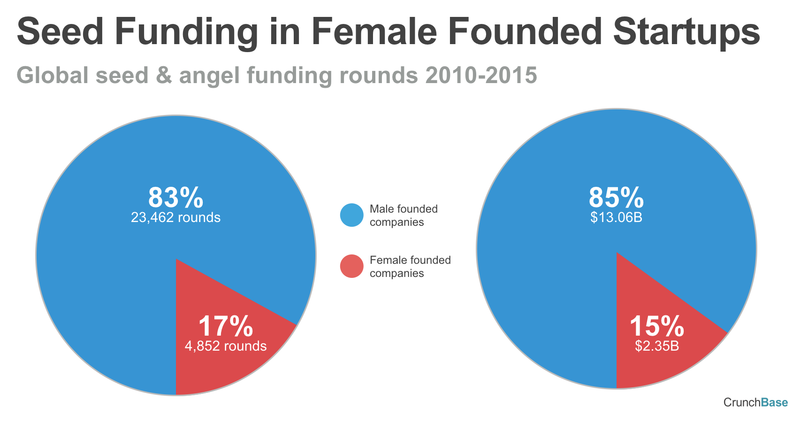 We concluded that female founders are gradually doing better when it comes to funding. That data also opened a number of related questions. For example, are some venture firms more likely to fund female entrepreneurs than others? And related to that question, does the presence of female investing partners in a venture firm increase the likelihood of an investment in a female founder? Now that CrunchBase has a strong data set for female founders, as well as investing partners, answers to these questions are within reach. Between 2010 and 2015, 10 percent of venture dollars globally, a total of $31.5 billion, funded startups that reported at least one female founder. This represented 3,265 funding rounds or 12 percent of all venture funding rounds. These numbers establish important benchmarks for future analysis, as well as help us understand which firms are best disposed to female entrepreneurs. In order to get a closer look at the venture firms investing in female founders, we compiled a list of all the firms that closed 45 or more investments between 2010 and 2015. We found 54 firms whose portfolio of investments in startups with a female founder exceeds the industry average of 12 percent. Of those 54 firms, 24, or 44 percent, have at least one female investing partner. Does that data suggest that firms with at least one woman in the partner ranks are more likely to invest in female entrepreneurs? Probably not, at least as far as we can tell at this point. That’s because we already saw that 38 percent of the top 100 firms have at least one female partner. So it’s no surprise that 44 percent, a modest uptick over the 38 percent, of the firms investing at above-average levels in female founders would have a female partner. That 38 percent versus 44 percent may not tell the whole story in the long run, however, because we are looking at a dynamic situation when it comes to women in venture. Most firms with a female partner have only one so far, and some of those are relatively new hires. In other words, it may be too early to determine whether female investors alter the funding equation for female founders. Within that broader data set, however, there is an indication of what the future may hold. If we single out firms that have both a high number of rounds in female-founded firms and those rounds also represent a high percentage of their total, we find a small collection of firms that share a clear attribute: The partnership was either founded by a woman and/or there is a relatively high percentage of female partners. The firms that do well both in percentage terms and also scale well in absolute numbers of rounds are Greycroft Partners, with 22 percent and 36 rounds; Canaan Partners, with 20 percent and 33 rounds; Upfront Ventures with 26 percent and 21 rounds; Kapor Capital with 31 percent and 18 rounds; and Converge Venture Partners with 24 percent and 15 rounds. To be fair, it’s also true that some all-male firms are also standouts, including Great Oaks Venture Capital with 23 percent and 22 rounds; Slow Ventures with 25 percent and 16 rounds; and Baseline Ventures with 21 percent and 13 rounds. In any case, based on this subset of data, there is evidence that, as the influence of female investors in partnerships expands, there is likely to be a benefit for female founders. The charts below rank the who’s who of investing in female founders by percentage and by round. The list includes venture, micro venture, and corporate venture firms that made 45 or more investments between 2010 and 2015. We also ran the same analysis on seed investors, where, as we noted above, some 17 percent of all rounds in CrunchBase went to firms with female founders. We looked at firms that closed at least 45 rounds between 2010 and 2015, and found 51 firms that surpassed the industry average of 17 percent. Of those 51 firms, 23, or 45 percent, have at least one female investing partner, which is very close to the 44 percent we found for the top 100 venture firms. There is one curious data point we noted, however, which suggests that female founders may not have to worry much about the arrival of more female investors in order to make more progress. Four of the five highest in terms of percentage of total rounds in startups with a female founder — SOSV, VTF Capital and Metamorphic Ventures — have no female partners, though the top firm, MassChallenge, at 42 percent of its portfolio, has a female managing director in Mexico. On the other hand, the five most active seed investors by round — 500 Startups, Wayra, Startup Chile, Y Combinator and TechStars — each have at least one female investing partner. The charts below rank top seed firms’ investments, by percentage and round, in startups with a female founder. The firms listed made 45 or more investments between 2010 and 2015. — 7 percent of investing partners at the top 100 venture and micro-venture firms are women. Looking across all firms, the percentage rises slightly to 8 percent. 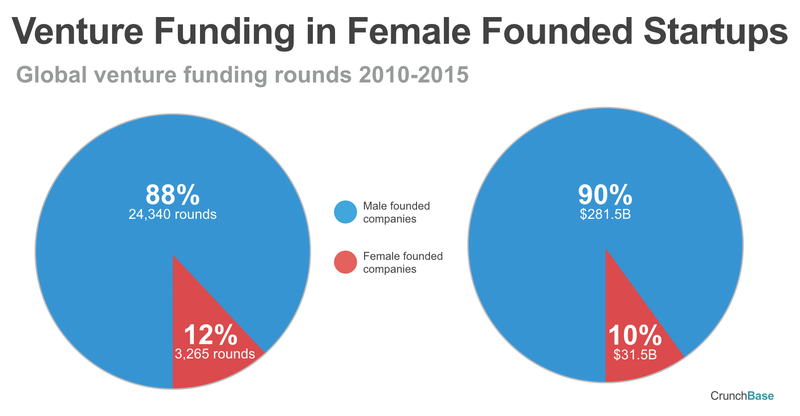 — 12 percent of venture rounds and 10 percent of venture dollars globally between 2010 and 2015 went to startups with at least one woman founder. — 17 percent of seed rounds and 15 percent of seed dollars globally between 2010 and 2015 went to startups with at least one woman founder. — There is scant evidence yet to suggest that on an industry-wide basis firms with a female partner are more likely to invest in startups with a female founder. There is clear evidence, however, that the small number of venture firms with female founders and/or an unusually high percentage of female partners, invest at elevated levels in female entrepreneurs. — Seed investors follow the same pattern as venture investors when it comes to the percentage of female partners overall and their impact on a firm’s investments in startups with female founders. Thank you to all the women and men who provided insights for this study. This story was updated on April 20, 2016, to reflect that we miscounted NEA’s partners. The correct count is five not the four we originally reported.